Have you ever seen the Green Flash? Millions of people swear they have. Thousands of people look for it every evening. 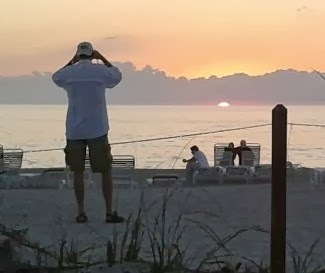 I watched for it just last night at Sunset Beach at South Seas Island Resort on Captiva Island, Florida. What's the Green Flash? It only occurs in a location where the sun sets into the ocean in the evening. Supposedly, the water conditions, especially the height of the waves or calmness of the sea has to be perfect. Of course, it can't be a cloudy since the setting sun is a partner to the creation of the Green Flash. Some say imbibing a wee bit (or more) of adult beverage prior the the evening show is also a partner to the creation of the flash. It certainly is in Key West where, I'm told, hundreds gather each evening to watch nature's spectacle. I'm told people line the rails on cruise ships, drinks in hand, waiting to toast the Green Flash. I don't know. I've not been to Key West or on a cruise ship, but I've watched for the Green Flash on beaches in California, from fishing boats in the Pacific Ocean and other locations, including the above mentioned, Captiva Island veiwing spot. There's even a great restaurant on Captiva Island named the Green Flash. What is it? Supposedly, it happens as the setting sun slides into the sea and the sky dims from its absence. It only shows a split second after the last bit of sun disappears under the horizon so don't blink or use that instant to take another sip of your adult beverage. The science behind the flash holds that when the light of the now unseen sun shines through the upper strata of the ocean the sun rays now filtered green through the sea water produces a momentary green flash bursting forth just above where the sun disappeared. Some say they've watched for it and never seen it. Me? I see it every time, at least in my mind's eye. And that makes watching for it, when I have the chance, something I'll never pass on doing.